The Department of Pediatrics and Newborn Medicine at Englewood Hospital and Medical Center offers family-centered care in designated kid-friendly units. Members of the pediatric care team include board-certified pediatricians, neonatologists, emergency medicine physicians, pediatric anesthesiologists, certified child life specialists, and pediatric nurses. Our specialists provide a full spectrum of services for common and complex conditions, with particular expertise in neonatal intensive care, gastroenterology including Crohn’s disease and ulcerative colitis, cardiology, surgery, and outpatient rehabilitation. For subspecialty services that are not available at Englewood Hospital, our experts will connect you with the right resources to make sure your child receives the care he or she needs. The Child Life Program helps ease anxiety and stress prior to medical procedures or hospitalization for children and their families. A certified child life specialist will work with your child to explain all events, sights, sounds, and sensations he or she may encounter during their time here in an effort to minimize fear and confusion. Preparation for all aspects of any medical experience – ranging from blood work to surgery – will help make the visit or stay less traumatic for children and their parents, too. If your child is scheduled for surgery, a child life specialist will provide pre-operative preparation and a guided tour in the secure setting of our pediatric playroom, which is designed to accommodate all age groups. These include toys for imaginary play, arts and crafts, story hours, music and video games, as well as a wide range of playroom and bedside ventures. Parents and children have the option of reviewing the virtual tour to help children better understand their hospital experience from start to finish. 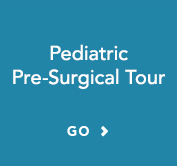 Families are also invited to take a walking tour of the pediatric facility so that everything from pre-operative procedures to recovery will be familiar before surgery. To ensure a familiar, relaxed atmosphere before and after surgery, children are encouraged to bring comforting objects from home. A familiar stuffed animal or toy can be brought to the surgical suite as a comfort during the induction of anesthesia. Following surgery, the toy is brought to the Recovery Room, where it serves as a familiar sign of home when they awake. Since children learn about their surroundings and how to overcome vulnerability through play, our child life specialist uses play and other activities to encourage expression of feelings and to promote a child’s sense of mastery over a seemingly uncontrollable situation. Our child life specialist interacts with children in age-appropriate language and offers educational and emotional support. This often helps turn a child’s hospital stay from an ordeal into a positive growth experience. Because we recognize the need for a “safe haven” in a hospital setting, no tests or treatments are performed at the child’s bedside. The patient room is reserved as the safe place, creating the secure environment that helps a child cope. Maintaining a child’s relationship with parents and other family members is an integral part of our program. Our child life specialist works closely with siblings to determine if they are experiencing any emotional trauma of their own to help them cope. 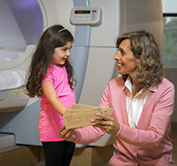 Pediatric MRI helps doctors diagnose a wide range of medical conditions in children using a large magnet, radio waves, and a computer that creates detailed images of organs and tissue without potentially harmful radiation. At Englewood Hospital and Medical Center, pediatric MRI is primarily used to diagnose developmental or congenital abnormalities, acquired neurological issues, tumors, and joint problems or injuries stemming from sports or other activities. Our team of pediatric specialists works with children and their parents before and during the procedure to reduce anxiety related to MRI, and, if possible, to avoid sedation, which can cause side effects in rare instances. In an effort to promote calmness and minimize the adverse effects of this medical experience, it is important to emphasize to your child that the MRI will not hurt. One way of explaining the procedure to your child is to liken the MRI machine to a big camera that doctors will use to take pictures of the inside of their body. While the exam is painless, the MRI machine can be scary, particularly to younger patients. It makes loud banging noises during the scan. The machine is a large, tube-shaped machine with openings at both ends. Your child will lie down on a narrow, movable table that slides into the tube, where the scan will be performed. This can sometimes take up to an hour to complete. Because movement can blur images during an MRI, the vast majority of children under the age of four will likely require anesthesia. Often, particularly with young kids and infants, sedation is needed to keep a child calm and comfortable to perform the scan. If your child does need to be sedated, Englewood Hospital is staffed with experienced board-certified anesthesiologists who will meet with parents beforehand to discuss risks and benefits. The team will then establish a plan of action with the parents to do what is in the child’s best interest with a goal of delivering the best, safest care possible. MRI is not invasive. There is no long-term risk compared to a CT scan, which uses radiation, and in most cases, it provides physicians more detailed information. When considering where to have your baby, it’s important to know if and how your hospital is equipped to handle high-risk pregnancies and birth. Our neonatal intensive care unit (NICU) is prepared to handle high-risk mothers and newborns and ensure they will have access to high-quality care. We have nurtured some of the smallest, sickest babies back to health, giving guidance and hope to families during what can often feel overwhelming, exhausting, and stressful. Our goal is to give every baby the strongest possible start and empower parents with educational opportunities during their baby’s stay. Parents leave feeling prepared for the next phase when it’s time to bring their newborn home. EHMC’s NICU is a modern 13-bed nursery, staffed 24/7 by board-certified neonatologists. Our NICU physicians will coordinate with other specialists, based on your baby’s needs or condition. Neonatal nurses, lactation consultants, social workers, child life specialists, surgeons, cardiologists, pediatric hospitalists, and pediatric anesthesiologists are among the team members who will execute the care plan and treat complications. Our labor and delivery unit is equipped with specially designed infant radiant warmers, featuring oxygen, oxygen monitoring, suction, and continuous positive airway pressure, which means we are prepared to transfer your baby from point A to point B safely. If your baby’s next stop is the NICU, our high-tech nursery features state-of-the-art incubators, monitors, and ventilators in a modern, comforting space. Our neonatal nurses provide a high level of personalized, round-the-clock care for your baby. From sponge baths, to feedings, to swaddling, and rocking, your little one will be on the receiving end of their clinical expertise and compassion. We understand that coming to the hospital can be an overwhelming and confusing experience for a child and his or her family. Our mission is to always do everything we can to make your time here as comfortable and stress-free as possible. The pediatrics unit is located on 8 Dean in the main building. You can reach the unit by taking elevator D up to the 8th floor, where you will see signage directing you to the unit. To call your child’s room, dial 201-894-3000 and press 0. An operator will request the patient’s last name and room number before you can be connected. 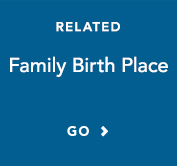 Parents may visit 24 hours a day. Other visitors are welcome 8 a.m. – 8 p.m.
Overnight accommodations are available for only one parent. Siblings must be accompanied and supervised by an adult. Visitors should be free of infection or illness and should not have experienced symptoms such as fever, cough, runny nose, sore throat, skin rash, vomiting or diarrhea within the 48 hours prior to a visit. If flu restrictions are in place, no visitors under 18 years of age or sick visitors are permitted on the unit. Please understand this is for your own safety and the safety of our youngest patients. We encourage all parents or caregivers to be active members of your child’s care team. We will check your child’s vital signs at least every four hours, depending on your child’s diagnosis or status, including temperature, heart rate, respiratory rate, blood pressure, and pain levels. Please save all diapers and inform staff of your child’s trips to the restroom. Please track your child’s intake of food and drink with each meal. If breastfeeding, please report the time and length of each feeding. Upon admittance, our Food and Nutrition Department will send a menu to your room. Please make your selections and return the sheet to your nurse. Three meals will be provided daily. If you have any questions about the selections, please contact the Food and Nutrition Department at 201-894-3097. We provide meals to your child in addition to two complimentary meals for parents or caregivers during each mealtime. Meals are not included for siblings. Visitors and other family members are welcome to dine at our Drapkin Family Café, which is located on the main floor. 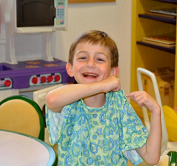 We understand the importance of play for children who are staying in the hospital. Play can introduce a sense of normalcy to your child, and may improve feelings of anxiety, stress, and confusion. Our child life program offers a range of activities that will give your child an important opportunity to relax and have fun. Our unit includes a playroom that is with equipped with activities for all age ranges, including Wii fun centers, DVD’s, board games, arts and crafts, toys, books, and more. You are welcome to take any toy or book from the playroom and into your child’s room. Those items will stay with your child until discharge, at which point they will be cleaned and returned to the playroom. Children who are in isolation or have symptoms of fever, vomiting, diarrhea, runny nose, or frequent coughing are not permitted into the playroom.